Lindsay became involved in the German Shepherd Dog breed in 1996. (Pictured below are her first 2 German Shepherd Dogs) In 1998 she began working in the animal care/veterinary field and familiarized herself with the many health problems that affect dogs, in particular the German Shepherd Dog breed. She also started attending obedience training classes, where she began to learn about the drives and temperaments associated with working dogs. 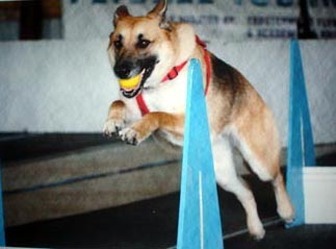 Over the years Lindsay expanded on her training experiences and tried out agility, conformation, rally, flyball, herding, dock diving, lure coursing, therapy visits, tracking, and schutzhund. In 2008, Lindsay attended The Academy of Dog Grooming Arts, where she finished the requirements to become a Certified Dog Groomer. In addition to her hands-on experience, Lindsay took distance learning courses from Penn Foster Career School where she finished the requirements to become a Certified Dog Obedience Instructor. As of 2011, she was also approved to become an AKC Canine Good Citizen Evaluator. In 2012 Lindsay attended the K9 Cop Magazine Military and Working Dog Conference, to learn more about detection and dual-purpose K9 work. In 2016, Lindsay was approved as a UKC SPOT Evaluator and began the process to become certified as a conformation and rally obedience judge. In 2017 she attended the Do More With Your Dog seminars hosted by Kyra Sundance, and became certified as a Canine Conditioning Coach, Stunt Dog Judge, and Associate Trick Dog Instructor. She continues to further her education by attending breeding and training seminars given by top speakers in the industry, and by working with/training her own dogs in a variety of activities. Currently, she works full-time as a dog groomer. 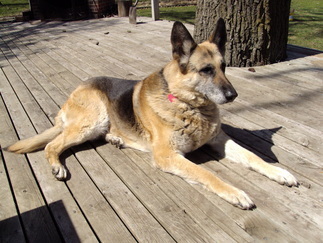 Lindsay bred her first litter of German Shepherd Dogs in 2009. She hopes to be able to achieve great things with her German Shepherd Dogs, and more importantly, hopes that others will enjoy their Granville German Shepherds for many years to come!